When you think about garage doors, do you realize that the garage door is one of your home’s most prominent features? Not only is the garage door visually prominent, it is also a major functional part of the home. The garage door must look good as well as perform as expected day in, day out. As a large moving part that is used several times per day, raising and lowering as needed, breakdowns are inevitable. Springs break, rollers get jammed, tracks warp, garage door openers seize up, remote controllers fail, wiring shorts out, doors warp, garage door windows break, and so on. 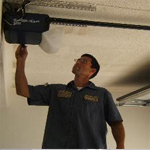 Katy Garage Door Repair is your one-stop garage door repair source. We can handle any type of garage door repair that you may need. In addition to being expert overhead door repair professionals, we are also dedicated to providing prompt service with same day service available. While we are skilled garage door repair specialists, we also understand that some garage doors are beyond repair. We also understand the visual impact that a new garage door can make. Whether you need a new garage door because the old one is worn out or because you want to update your home with a fresh new look, our garage door installations are superb! We carry all types of garage doors including single car garage doors, double garage doors, rollup garage doors, wooden garage doors, steel or aluminum garage doors, swing out garage doors, commercial garage doors, residential garage doors, and custom garage doors. We’ve installed and repaired thousands of garage doors throughout Katy, Texas! Call us today for a garage door consultation to find out what the best course of action is: repair or replace.